Just Catamarans broker Derek Escher explains how lift works, wind speed, and when to choose daggerboards. In my teaching courses, I often start out by giving an explanation to students on some very basic level physics about how “lift” works. The idea that a boat can sail into the wind, or that a boat can go faster than the speed of the wind is a foreign concept for many. And, even seasoned sailors grapple with how a sailboat can go twice, three times, even quadruple wind speed! It is perplexing!! In my brokerage work, I offer nearly the same explanation to customers as I do to my students, that the central purpose of a foil underwater is intended to create lift, while minimizing drag. 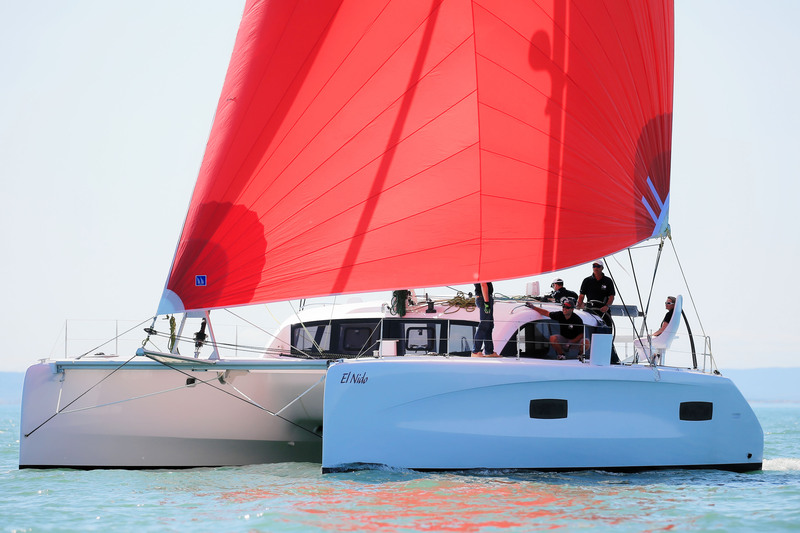 For one segment of the catamaran market, which is inhabited by brands like Outremer, Gunboat, H&H, Balance, Catana and others, the most effective way to increase performance is to incorporate foils that are highly efficient. In the case of these boats, it comes back to daggerboards. For some catamaran buyers, this is a big thing, for others, not so much. Foils, and lift… In any serious discussion about sailing, we need to understand these terms and concepts. Sails, keels, and rudders are foils. Foils are designed to create lift, and to minimize drag. Look no further than an airplane wing to understand this. An efficient airplane wing is long and skinny. Why? Because it increases lift while minimizing drag. America’s cup cats had wing masts which were very tall and skinny. Why? Because that is where maximum efficiency of a foil lies to create lift. An efficient foil is going to have a high aspect ratio, in other words, it needs to be long and narrow. This, of course, creates some problems in sailboat design. 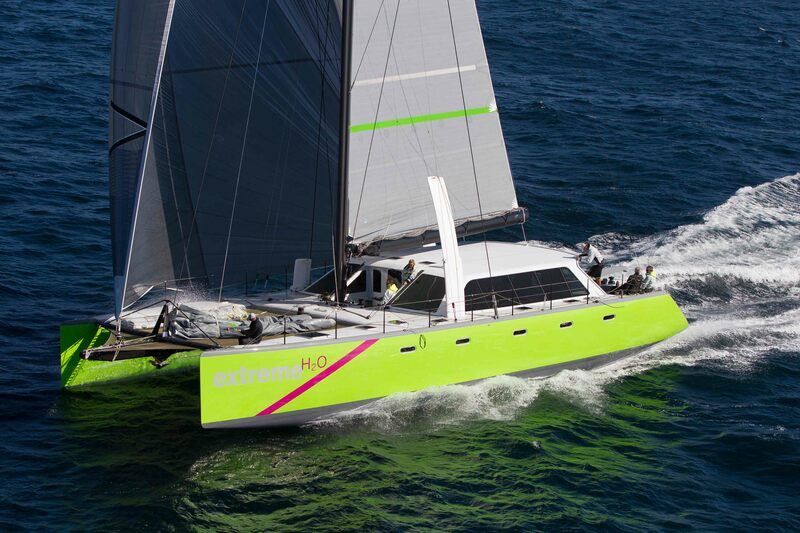 There are many compromises that go into catamaran design, and monohull design for that matter, so this is really good to understand. What then is lift? Lift is created when a foil, whether it be in the air (aerodynamic) or in the water (hydrodynamic), through movement, creates a high-pressure zone on one side, and a low-pressure zone on the other. The working foil then moves away from the high pressure toward the low pressure. Lift. When a plane heads down the runway at speed, the air is forced underneath the wing, creating high pressure. At the same time, there is very little pressure on the top side of the wing. At this point, the wing moves from the high pressure toward the low. As the speed increases, this force, lift, is stronger than gravity, and the plane takes off. Here is another way to understand this. Stick your hand out the window while you drive your car (making sure you aren’t too close to any objects of course!). Turn your hand sideways at about 45 degrees to the wind. Your hand will move toward the area that you have protected from the wind. High pressure where the wind hits, low pressure where wind is blocked. If you adjust that concept, you get a foil that creates lift in a desired direction. That is why foils are curved, because we want to lift to be directional, which is behind the curve. Abstractly, this is why you can sail upwind. Your sails, keels, daggerboards and rudders when moving forward into the wind create high pressure of the windward side, and low pressure on the leeward side, and the boat is pulled forward, into the wind. Because the foil directs the boat around the curve of the foil, the boat is lifted forward, and to windward. This is also why airplanes fly. The faster the foil is pushed along, the more lift it creates, and the more efficient the foil becomes. So, how is it that a boat can go faster than wind speed? Let me offer up this explanation. The biggest limiting factor to a boat’s speed is drag through the water. Finding ways to eliminate drag is the key to speed. The more you eliminate, the easier it is for a boat to move fast. This is why more and more we are seeing innovative hull shapes, creative underwater appendages, and even planing hydrofoils on race boats. While America’s Cup style “L” blades (L shape) are not really practical, safe or desirable for cruising boats, “C” shaped blades are starting to be used. This is called foil assist, and essentially what is happening is the blade lightens the boat’s displacement, which in turn decreases the drag the boat has through the water. Obviously, other factors like weight, waterline, and rig are critical to the equation too. How much of this does a cruising sailor want? Up to them! For some, a lot, for many, none. For fun though, let’s try to understand all of this a bit more. Let’s look at the extremes. 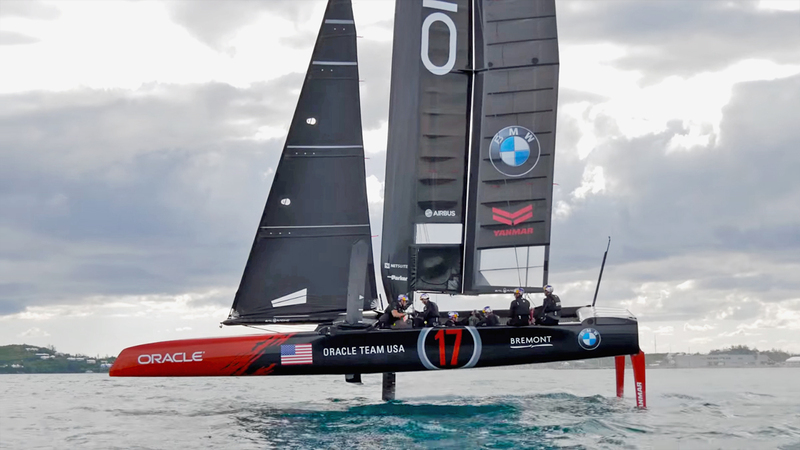 America’s Cup boats, Ice Boats, windsurfers and kite boards, etc are super efficient sailors. In each of these cases, virtually all drag has been eliminated. So then what? Well, just picture this: You design a boat, board or iceboat. That vessel has a mind of its’ own!! Seriously! And in the mind of that vessel it has no drag, so every bit of wind it grabs on to, it can go that speed. So here we are, out sailing our super duper vessel, and the wind is on the beam at 15 knots. Our ultra cool vessel thinks “hmmmm, 15 knots, I got this!! !”, and bingo, she’s off at 15 knots!! Except….there is this thing called apparent wind!! So now that we’re going 15, we are actually feeling 25 knots of wind, our speed, plus the actual wind combined. The wind angle now moves forward of the beam, and voila, the boat takes this bet, and states loudly “I feel 25, so I am going to go 25!!”. And sure enough, here we are going 25! Except……now the boat feels 35 knots of wind because the forward speed, plus the true wind combined has increased again!! The angle of the wind moves forward again, so now we are getting pretty tight to the wind, but this whole thing keeps on going, and going, until in the case of the America’s Cup boats, the wind is at 13 degrees off the bow. That’s it! In 10 knots of breeze, Cup boats went 40!! At 13 degrees off the wind (apparent) Ice boats are right in there too. Did you get all that? Confusing, but really cool! If we understand what lift is, and how foils then contribute to the efficient making of lift, we begin to get a picture of what drives sailboats. I haven’t even mentioned sails, but of course, they do the same thing, and it is very important that they too are as efficient foils as possible, depending on your end performance goals. The higher aspect ratio the sails are, generally, the faster they are. How does this affect you, and that cruising catamaran you want to buy, or already own? Or, that really tricked out racing/cruising monohull? Well, Cruising cats are phenomenal living platforms. They are stable, comfortable and are highly desirable for many purposes. If in that list of advantages for you is sailing performance, you will need to understand the compromises, and trade-offs of keels versus daggers, of high-quality rigs, and of weight management, and hull design. In monohulls, the lead sled idea is probably going to have to go if you want to maximize boat speed too. You’ll need to get your mono up in the water, cut off some drag, and go from there. I can teach you how to make your existing keel cat sail better, but I won’t be able to make it into a race boat. Same with your old New England style sloop. Rig balance, VMG, and personal habits can help improve any boat’s sailing properties. A good sailing course and some rudimentary understanding of lift, foils, drag, and discipline will help. We just have to be realistic about what your boat is designed to do. If you want a 280 mile a day cat, that will go upwind and downwind, you’ll have to give up something too. If you want a lot of lead under you, your speed potential is what it is! There is a world of possibility out there, and no matter which course you choose, you are way ahead of the game to be out on the water as opposed to sitting in an office somewhere, so go get ‘em!!! 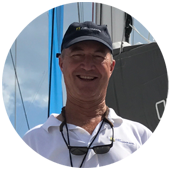 Speak with Derek Escher to find the right catamaran for you.